For most of us, the flu is a minor inconvenience. A box of Kleenex, a day or two of missed work, and that’s it. But not everyone is so lucky. A bad case of the flu can send a person to the hospital, or even to the grave. The number of American fatalities associated with influenza—a highly contagious respiratory virus—varies wildly from year to year: in the winter of 2011–2012, 12,000 people died; the next year, nearly 50,000. 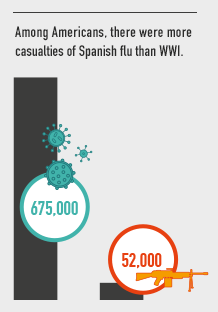 During the 1918–1919 Spanish flu pandemic, more than a quarter of the country caught the bug, and 675,000 died. The virus claimed more American lives than World War I and, by some estimates, 50 million people around the world were felled by that one pandemic. Predicting the magnitude and timing of outbreaks has long been a guessing game, because the information we’ve had about influenza has been old and incomplete. Like the visible tip of an iceberg, the data on documented cases fails to account for the underlying dynamics of how the virus spreads. But in recent years, scientists have developed methods drawn from computer modeling and weather forecasting to provide a more complete picture of these invisible forces. Every year since 2013, Jeffrey Shaman, PhD, associate professor of Environmental Health Sciences and director of Columbia’s Climate and Health Program, has published weekly forecasts of the flu season. 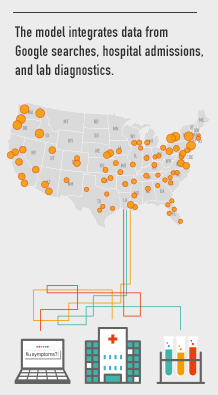 Specific to 108 cities across the country, the online projections predict whether cases are expected to rise or fall and by how much. A new version of the system drills down to the neighborhood level, using data on commuter patterns. In New York City, where it was tested, the system might, for example, tell residents in the South Bronx that they are more at risk than someone living in Soho. In temperate climates like North America’s, the flu arrives every year sometime between October and May. What drives this seasonal pattern has been the subject of scientific debate. Some have argued that reduced sunlight exposure during the cooler months suppresses our immune systems; others, that more time spent indoors increases our exposure to infected people. In the fall of 2007, Shaman, a Columbia University–trained climate scientist with a special interest in hydrology, had a hunch about humidity. Reanalyzing data from an experiment involving guinea pigs, he found that drier air increased the likelihood that the lab animals would catch the flu. Using that insight, he created a computer model that was able to reproduce the average rise and fall of three decades of human cases. 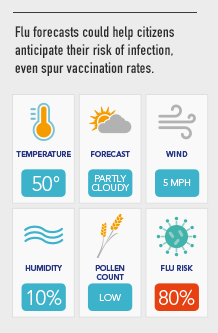 While Shaman’s humidity model could predict the average timing of many flu seasons, it wasn’t powerful enough to draw conclusions on any single season. In December 2008, Shaman and his former PhD classmate Alicia Karspeck discussed the problem over lunch. Karspeck, now a scientist at the National Center for Atmospheric Research, suggested that they adapt the mathematical methods used in meteorological forecasting, which simulate the weather based on thousands of observations—from weather satellites, ocean buoys, and the like—and extrapolate into the future. Using a similar approach, Shaman and Karspeck built a computer model to simulate how influenza spreads through a population, drawing on hospital admissions reports and data provided by Google on cold- and flu-related search queries. Their model generates hundreds of estimates, creating visual “spaghetti,” with some trajectories indicating a sharp rise in sickness and others a gradual uptick or downward trend. Then the algorithm applies a technique from weather forecasting called data assimilation to weave those strands of spaghetti into a single prediction. Soon Shaman was generating his predictions in real time. When he first showed his work to officials at the U.S. Centers for Disease Control and Prevention back in 2012, he was met with skepticism. Undeterred, he sent them unsolicited weekly forecasts. Then in 2013, CDC officials invited Shaman’s group and five other teams to forecast the current flu season. The Mailman School team routed the competition. Their triumph owed to the use of the same kind of confidence probabilities people have come to expect from weather forecasts—if there’s an 80 percent chance of rain, we’ll take an umbrella. 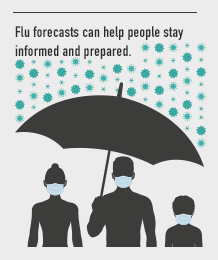 Similarly, influenza forecasts have the potential to provide actionable information to both health officials and the public. Meanwhile, the researchers tested their forecasts in Hong Kong, where semitropical conditions allow influenza rates to ebb and flow throughout the year. In partnership with researchers at Hong Kong University, Shaman and Yang tweaked their computer model to generate three-week forecasts with up to 93 percent accuracy. The team is now setting up a system for real-time predictions to guide public health decisions for the city—and potentially beyond. “Having a foothold there and being able to make predictions in that area of the world is going to be very valuable on the global stage,” says Shaman, who notes that new flu strains, particularly pandemic varieties, often emerge from Southeast Asia. 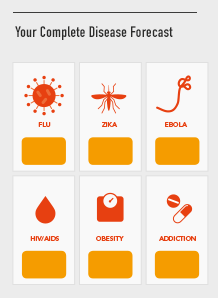 Near the end of the outbreak, Shaman’s team obtained district-level data in Sierra Leone. With the additional information, they were able to recreate the internal dynamics of the outbreak and identify critical junction points in the districts of Kenema and Port Loko. In a retrospective analysis published in 2015 in the Journal of the Royal Society Interface, Yang and Shaman showed that had the forecast been done in real time, officials might have interrupted the epidemic’s spread by focusing interventions on those two districts. Tim Paul edits the Mailman School's Transmission newsletter. His report on immigration and refugee health appeared in the 2016 edition of this magazine.